For the month after I was married, I wasn't working, so I had lots of free time to try new recipes, experiment with some ingredients, and prepare grand meals. Piña-Fried Rice was probably one of my favorite that came from that time, and the beautiful thing is that it takes no time to make! Its amazing and the presentation is sweet too! 1. Cook rice as directed. While cooking, begin work on the pineapple. What you want to do is slice the Pineapple in half, length wise (like a hot dog). Then remove the inside goodness (while leaving the shell intact). Chop up the pinapple peices into bite size chunks. 2. In a wok or large pan heat oil and add onions, garlic, pepper flakes, and Chile or Jalapeno. Saute until soft. 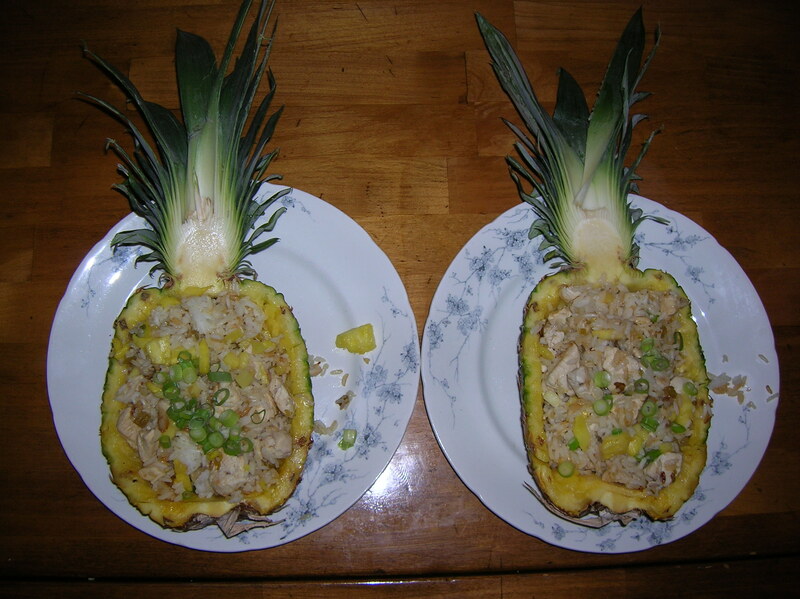 Add pineapple pieces saute for 5-ish minutes. Then add finished rice. Stir around and let it all heat up. 3. Add cilanto for topping and serve in the pineapple shell! EAT! This is a serious fave of mine, and its so easy and beautiful. Sometimes I add some chicken in there that is already cooked or even some shrimp. Also if you like it spicy add some chile sauce! It can easily become a main dish. What is your favorite way to eat pineapple? Before & After: The Home! Stationary, Why Are You Expensive?